What Are You Recommending, Craig Morgan Teicher? NBCC members and finalists and winners of our book award were eligible to vote in the winter edition of the NBCC’s Good Reads. 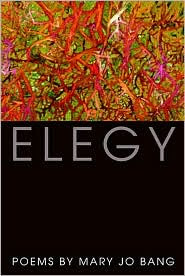 Poet and critic Craig Morgan Teicher, whose debut volume, “Brenda is in the Room,” is just out from University of Colorado Press, recommended MEYER by Stephen Dixon, AN ELEMENTAL THING by Eliot Weinberger, and ELEGY by Mary Jo Bang. Here’s what he had to say about them. These are simply three books that I’ve loved lately. I can’t get enough of Stephen Dixon, and fortunately he’s unbelievably prolific. As I said in a review of this book I wrote for Time Out New York, I just don’t think there’s anyone out there doing a better job of giving a play-by-play of what it’s like to age—and to experience sensations of life’s moments—than Dixon. People talk about his formal experimentation, but I don’t think that has much to do with what makes his books so good—Dixon’s fiction has a big soul, and it’s a sort of Everyman’s soul. It’s hard not to find yourself in it. I was given a copy of Weinberger’s new book; I must admit I hadn’t read him before, fool that I am. Now I’m hooked. These short essays in which accrual of facts, and the juxtaposition of those facts, makes ideas, opinions, energy rise up out of the cracks. Weinberger can write about anything. And even once one becomes familiar with his method, he’s still full of surprises. Craig Morgan Teicher is an editor at Publishers Weekly, a freelance critic, and the author of Brenda Is In The Room and Other Poems. "What Are You Recommending, Craig Morgan Teicher?" was posted February 15, 2008.